I love September in Omaha because theater productions start back up, pumpkin patches start to open up, and apple picking begins. You’ll find a few of my favorite events below (including Fields of Flight and Touch-A-Truck). 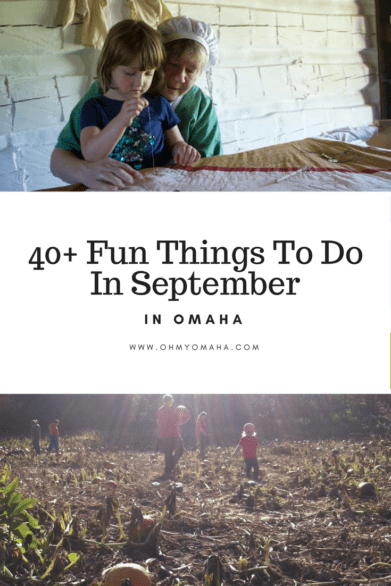 For more seasonal day trip ideas, visit my posts about 10 Things You Must Do In Council Bluffs In The Fall and Exploring Nebraska City With Kids! When: Sept. 1-2, and Sept. 30-Oct. 1, 10 a.m. to 5 p.m.
Where: Fort Atkinson State Historical Park, 201 S. Seventh St., Fort Calhoun, Neb. When: Sept. 1-3; hours are Friday from 6 to 11 p.m., Saturday from 5 to 11 p.m., and Sunday, noon to 11 p.m.
Where: American Italian Heritage Society, 5110 N. 132nd St. When: Sept. 1, 5 to 7 p.m. When: Sept. 2, 6 to 10 p.m. When: Sept. 2-4, 9 a.m. to 5 p.m. Cost: Included with regular zoo admission, which is $19.95 for adults (ages 12+), $18.95 for seniors (65+), $18.95 for military adults (ages 12+), $13.95 for kids (ages 3-11), and $12.95 for military kids (ages 3-11), and FREE for zoo members. When: Sept. 4, 11:45 a.m. to 4 p.m. When: Sept. 4, 5 to 8 p.m. When: Sept. 6, 5 to 7:30 p.m.
Where: Memorial Park, 5651 Underwood Ave. When: Sept. 8 and 9; Friday events start at 5:30 p.m. with live music, Fun Flight at 6 and glow at dusk; Saturday events start at 7 a.m. with Competition Flight, another Competition Flight at 5:30 p.m., live music at 5:30 p.m. and glow at dusk; Sunday event is a Competition Flight at 7 a.m. When: Sept. 8-24; performances are Fridays at 7 p.m.; Saturdays at 2 and 5 p.m.; and Sundays at 2 p.m.
Where: Skinny Bones Pumpkin Patch, 3935 State Highway 133, Blair, Neb. When: Sept. 9, noon to 4 p.m.
Where: Papio-Missouri NRD at Wehrspann Lake, 8901 S. 154th St. When: Sept. 9, 10 to 11 a.m. When: Sept. 9, 11 a.m. to 3 p.m.
Where: First Data, 6855 Pacific St. When: Sept. 9, 10 a.m. to 6 p.m., and Sept. 10, 10 a.m. to 5 p.m. When: Sept. 10, 1 to 5 p.m.
Where: 7915 N. 30th St. 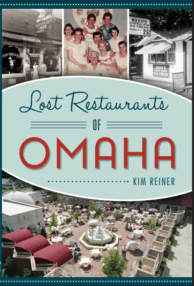 When: Sept. 14, 6 to 8:30 p.m.
Where: Omaha Public Library Abrahams branch, 5111 N. 90th St. When: Sept. 15, 2 to 4 p.m.
Where: Omaha Public Library Sorensen branch, 4808 Cass St. When: Sept. 15, 4 to 11 p.m.
Where: Reverb Lounge, 6121 Military Ave.
Where: Vala’s Pumpkin Patch, 12102 S. 180th St., Gretna, Neb. When: Sept. 16, 9, 10 and 11 a.m. When: Sept. 16, 9 a.m. to 11 p.m. When: Sept. 16, 9:30 and 11 a.m. When: Sept. 16, 10 to 11 a.m. When: Sept. 16 and 17, 10 a.m. to 4 p.m.
Where: Gifford Farm Education Center, 700 Camp Gifford Road, Bellevue, Neb. When: Sept. 16 and 17; Saturday from 10 a.m. to 5 p.m. and Sunday from noon to 4 p.m. When: Sept. 16 and 17, noon to 4 p.m. When: Sept. 16, 1 to 3 p.m. When: Sept. 16, 4 to 7 p.m. When: Sept. 19, 4 to 5 p.m. When: Sept. 20, 10 a.m.
Where: Omaha Public Library Bess Johnson Elkhorn branch, 2100 Reading Plaza, Elkhorn, Neb. When: Sept. 20, 3 to 5 p.m. When: Sept. 22, 6 to 8 p.m. When: Sept. 25, 6 to 8 p.m. When: Sept. 27, 9:15 to 10:15 a.m. When: Sept. 28, 7 or 8 p.m.
Where: Alamo Drafthouse Omaha,12750 Westport Parkway, LaVista, Neb. When: Sept. 30, noon to 3 p.m.
Where: Joslyn Art Museum, 2200 Dodge. St. When: Through Oct. 14; Tuesday – Friday, noon to 8 p.m., and Saturday, 11 a.m. to 5 p.m.
See my video on the exhibit here! When: Wednesdays, Sept. 6, 13, 20, and 27, 11 to 11:30 a.m. When: Saturdays, Oct. 14, 8 a.m. to 12:30 p.m. 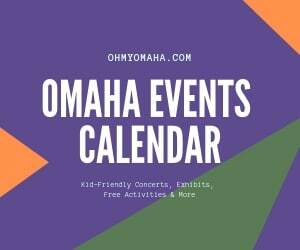 When: Sundays, through Oct. 15, 9 a.m. to 1 p.m.
Never miss fun things going on in Omaha! Stay in the know – subscribe to the FREE bi-weekly e-newsletter sharing giveaways, new posts and updates to popular posts like this one! Subscribe here.